ou probably know someone who suffers from migraines, whether it’s a friend, family member, or maybe even yourself. But have you ever wondered exactly what migraines are, and why they happen? The following guide provides insight into migraines including diagnosis, treatment, and clinical trials. Migraine is a condition characterized by episodes of severe headache, which produce throbbing pain in one or both sides of the head. Migraine can also cause nausea, vomiting, or heightened sensitivity to light, noise, or smells (photophobia, phonophobia, or osmophobia, respectively). In some cases migraine is preceded by an aura, which means they get “warning” symptoms, such as experiencing blind spots, flashes of light, numbness, speech alterations, mood changes, confusion. These symptoms are call prodrome and can happen up to an hour before the migraine starts. Although the exact cause of migraine is still unknown, most scientists believe that migraine is caused by an imbalance in certain substances which are naturally produced by the brain. This imbalance can affect nerve pathways, blood vessels and even the gastrointestinal system. It has long been thought that there is a genetic predisposition to suffer from migraine, since it can often been found in several members of the same family; they are also more prevalent in females. 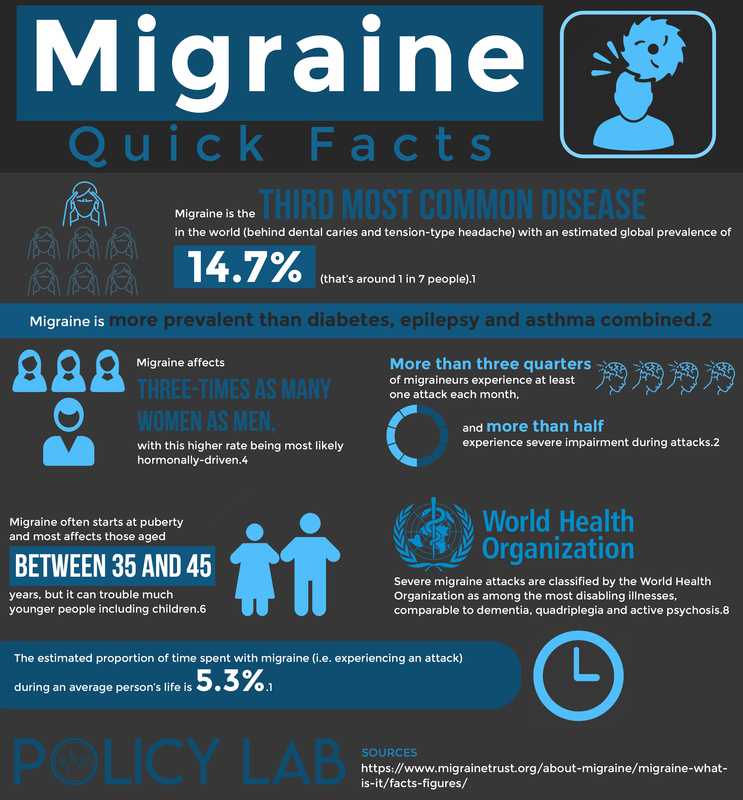 Migraine usually appears between the ages of 15 and 55 years old, and it is one of the most common type of disabling headache, affecting approximately 29.5 million Americans. Foods that contain monosodium glutamate (MSG), dairy, chocolate, cured meats. If you suspect you suffer from migraine, take note of the details that surround these headaches, such as: how often they happen, which part of your head hurts, how the pain feels, any other symptoms that happen at the same time, any triggers or prodromes that accompany the episodes, whether any other member of your family suffers from migraine, amongst other details. A doctor will carry out a thorough physical and neurological examination. Even though tests such as blood tests, CAT or MRI scans, or electroencephalograph will not diagnose migraine, they can help to discard other conditions which could cause headaches. There is no test to specifically diagnose migraine; instead, the diagnosis is made if the characteristics of the pain align with those of migraine, and if there is no other medical condition which can explain the headaches. Although migraine can’t be cured, there are treatments available which can help diminish the severity and frequency of the attacks, and to relieve symptoms during the acute headache. Some patients with mild migraine can find relief with nonsteroidal anti-inflammatory drugs, or NSAIDs, such as ibuprofen or aspirin. However, there are other two types of drugs which are mainly used to treat acute attacks of migraine. The two kinds of drugs used in the acute treatment of migraine are triptans (sumatriptan, almotriptan, rizatriptan, zolmitriptan, among others) and ergot derivatives (dihydoergotamine and ergotamine tartrate). They work by interfering with 5-HT receptors in the nervous system. These drugs usually work best when they are taken as soon as the migraine begins, which is the reason why many people always carry their migraine medication with them. It is important to note that not every patient responds to each drug in the same way; this is why it’s so important to work together with your doctor to find a treatment that works for you. Other medications work by preventing attacks, helping diminish their intensity or frequency. Most of these drugs were developed to treat other conditions; such as antidepressants, beta-blockers, and anticonvulsants. In some cases, when migraine is related to hormonal changes (such as a woman’s menstrual cycle), hormone therapy is used as preventive treatment. Talking to your doctor, and asking whether they know of any clinical trials which are available and that you can take part in. Go online and search for migraine clinical trials. Contact universities or hospital that do research in your area, and ask if they are conducting any migraine clinical trials. You will usually need to meet certain criteria to enroll in a clinical trial. These criteria are decided by the research team leading the clinical trial, and they are put in place to ensure the best results possible. By enrolling in a clinical trial, you will be gain access to treatment provided by highly qualified professionals, and you will also help other patients around the world by helping develop new therapeutic options. However, you can always leave a clinical trial if you aren’t satisfied with the results, or if the treatment causes any side effects. Can DFN-15 Terminate Migraine With Allodynia? Another way to improve your migraine is to make certain lifestyle changes, depending on what triggers your attacks. The first step to do this is to keep a “migraine diary”, which simply means recording your daily routine and habits to identify which cause a migraine. Record as many details as possible, including any food or drinks you consume, exercise routines, weather conditions, mood, hormonal cycles, any medications you take, symptoms that precede a migraine attack, and see how all of these things may be related. Foods that contain monosodium glutamate, tyramine, or nitrates, chocolate, alcohol, aspartame, certain fruits, processed fruits, nuts and seeds. Strong odors, lights, or sounds. Consuming too much caffeine, or on the contrary, caffeine withdrawal. Some patients report that learning how to relax or meditate helps them alleviate their symptoms. Make the lifestyle changes you feel are necessary and which help you improve your quality of life. Explain what migraine is, and how it affects you to your loved ones. Make sure they understand what your triggers are, and how to help you avoid them. For example, they can avoid playing music at high volumes, or carry a small snack with them to make sure you aren’t triggered by a missed meal. Let them know when they should call 911 or other emergency services, such as if you experience symptoms you’ve never had with migraine before. Choose quiet or relaxing activities to take part in with your friends and family.